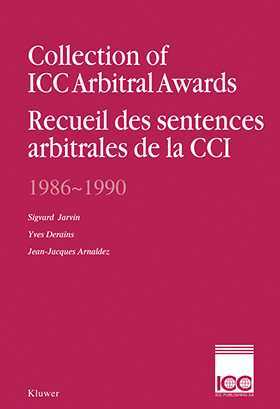 This second volume of the Collection of ICC Arbitral Awards contains the awards that have already been published between 1985 and 1990 in the Yearbook Commercial Arbitration, the Journal du Droit International (Clunet) and also in the International Construction Law Review. As in the past volume (1974-1985), certain awards are produced both in English and French. The Analytical Table of Volume II covers all the awards contained in both Volumes I and II. The publication also includes a Consolidated Analytical Table, a Chronological Index and a Table of Cross-Referenced Tables. This book is an invaluable reference for anyone who wants to be informed about the ICC arbitration procedure and the awards made applying the different laws of a variety of trading nations. It is equally useful to the practitioner involved in drafting, negotiating and resolving international commercial contracts as it is to the scholar seeking source material on today's trends in international private and commercial law. Consolidated Analytical Table of Awards 1974-1990.